During this summer’s Service Design course, Aalto students came together to work on the topic of Mobility as a Service for the case Otaniemi campus. The two resulting projects revolve around outdoor navigation and Otaniemi cycling services. At the multidisciplinary summer project course for Ba and MA students from all Aalto schools, we decided to look on the topic of Mobility as a Service (MaaS) more closely. In autumn 2018, the School of Arts, Design and Architecture will be moving to Otaniemi campus. Still, many Otaniemi visitors have difficulties to get around places and spaces. Despite construction sites, Otaniemi is a great place for walking and cycling with many interesting spots and places to discover. The course examined existing mobility and navigation services for visitors, students and those living there, researchers and service staff. We looked at Otaniemi’s historical development, on-going projects and future developments. We fully grasped the MaaS concept and its future progresses by visiting a young start-up, which is successful in MaaS implementation negotiating with existing providers and government. Another visit was to a company, which is already a well-established MaaS provider and is changing users’ behaviors towards higher use of electric car-pooling services. Students chose two projects: the first was investigating outdoor navigation for Otaniemi visitors and the second explored possibilities for Otaniemi cycling services. To understand possibilities for mobility in Otaniemi we created GIGAmaps and speculated transport future in Otaniemi with design fiction – what if Otaniemi got flooded. Cycling around Otaniemi gave us insights into many hidden places and spots. 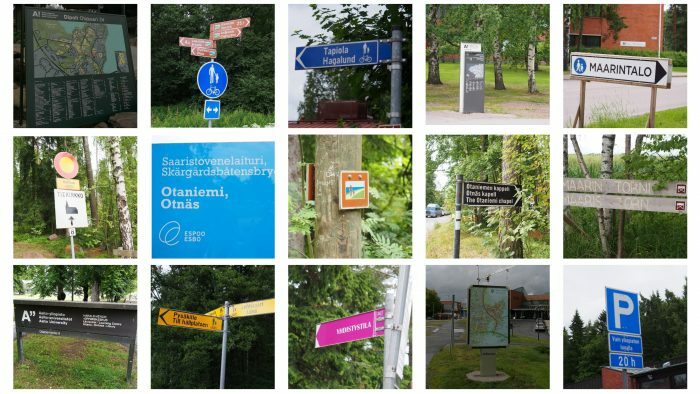 Students observed visitors coming to Otaniemi and their navigation habits when finding known, but also unknown places. 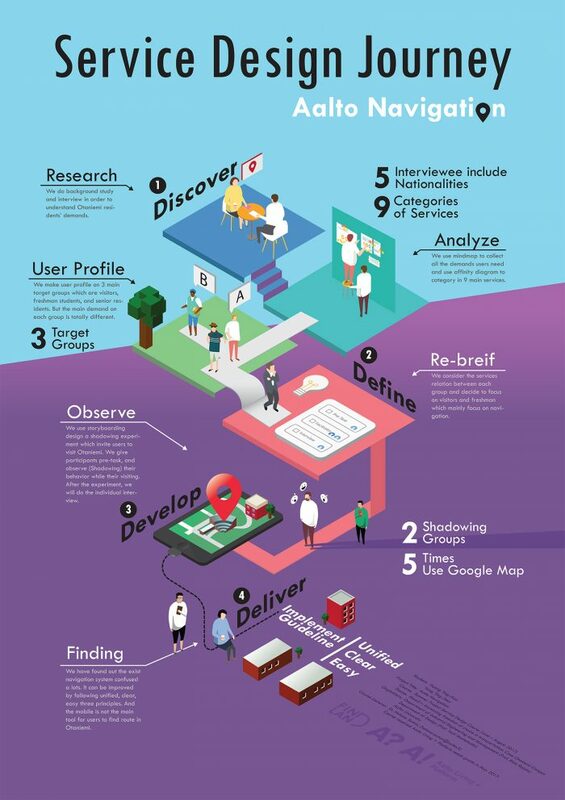 With case analysis and benchmarking we tried to understand how other mobility businesses work. The two projects in the booklet represent human-centred and sustainable solutions for all Otaniemi residents and visitors. The complex and confusing campus has currently complicated indoor and outdoor signs. Therefore, the first project suggests the redesign of the campus signs and navigation system following unified, clear, and easy principles. The second project is taking the first steps of creating a unique biking culture to Aalto and Otaniemi campus; a service that combines the convenience of having a bike available inside the campus and enabling a carefree and fun way of mobility.